Child-friendly? Combining six fantastic tales from cultures around the world, French director Michel Ocelot weaves a story of magic, mystery, adventure and peril in Tales of the Night that will have children of all ages under its spell. Ooh la la! Leave it to the French to take the children's film genre and transform it into high art. Not that American filmmakers are behind the curb when it comes to capturing kids' imaginations – every movie Pixar has ever done is a testament to that – but Tales of the Night certainly sets the bar high when it comes to revolutionary visual animation and storytelling. And as a parent, it's refreshing to take the little ones to a movie that isn't Diary of a Wimpy Kid or (shudder) anything having to do with Justin Bieber. Before I get into the story here, I think the film's backstory needs a little bit of explanation. 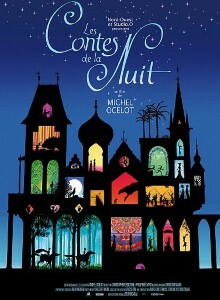 Creator, director and writer Michel Ocelot first introduced Tales of the Night (ou, Les Contes de la Nuit en francais) to French audiences as a television special in 1992 – using shadow puppets to tell three fantastic fairy tales. This style of animation was one that Ocelot first used in 1989 with the TV series Cine si, and he went on to employ it again in later projects as well. Ocelot's success with shadow puppets prompted him to give Tales of the Night a revamp in 2011 – this time including new stories and a subtle 3D effect. On to the story. The film intertwines six incredible fairy tales together with historical, cultural and mythological influences from across the globe. Ocelot focuses on stories set in the African plains, Aztec civilization, feudal Europe and the mountains of Tibet, with one occurring in the fabled Land of the Dead. Along the way, the characters encounter villains, monsters, magic, talking animals, princesses and all manner of adventures animated against vibrant, glowing backgrounds. It's a magical way to weave a tale – and one that most 3D-animated children's movies wouldn't even think to attempt (I'm looking at you, Madagascar 3. I still want my money back.). Normally I like to make fun of lofty French cinema, but this one's just too good to sell short, especially when it gets my kids to shut up about this season of Glee for an hour and a half. Child-friendly? Michel Ocelot's Tales of the Night is about as child-friendly a film as they come, blending stories of vampires, werewolves, knights, wizards, princesses and other folklore together in a truly amazing style of shadow animation. Don't let the "unrated" labeling scare you away either – the French just play by their own rules when it comes to children's cinema. Seriously, grab your kids and go see this one!